It seems that this is the summer for a huge number of RVers to make the journey to Alaska. One couple is writing about their journey in the blog Coloring the Void, which I have begun to follow. A recent post really hit home with me. “The RV Life” perfectly captures what our RV life is also about. The post describes the three types of days that comprise RV life – traveling, touristing and living. Finding a balance between driving from one place to another, seeing the sights and performing routine chores and errands can often be challenging. This is especially true for anyone making the journey to Alaska. It’s for this reason that Monday for us was a “living” day. After our whirlwind day of flightseeing and touring on Sunday, we stayed around the RV, gazed out at the water, did a load of laundry, wrote a blog post and simply relaxed. It was a perfect way to spend the day. I’m so glad that we have several days between ferry trips to be able to see each town at a slower pace. We took our time on Tuesday morning while checking out of the campground. It was foggy and we were in no hurry. We would be catching the ferry from Ketchikan to Wrangell, but it wouldn’t leave until 3:15 am. Ugh! Our plan was to spend the early part of the night camped at the ferry dock. 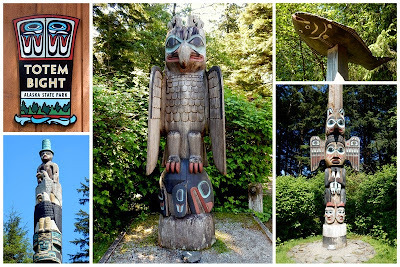 But before that we had two stops planned – Totem Bight State Park and Saxman Totem Park. Both feature totem poles and clan houses, and they share a similar history. In 1938 the Civilian Conservation Corp removed totem poles from abandoned villages and established totem parks, including those in Totem Bight and Saxman. In most cases Native Alaskans working for the CCC duplicated the original totems using traditional methods. The original poles were then discarded. This program helped train a new generation of carvers and fostered an appreciation for Native art. Totem Bight is a now a state park that recreates a model Native village. A clan house, or community house, that is representative of the type built during the early nineteenth century is the centerpiece. Fourteen totem poles surround the clan house, and a self-guided tour brochure describes the story behind each one. 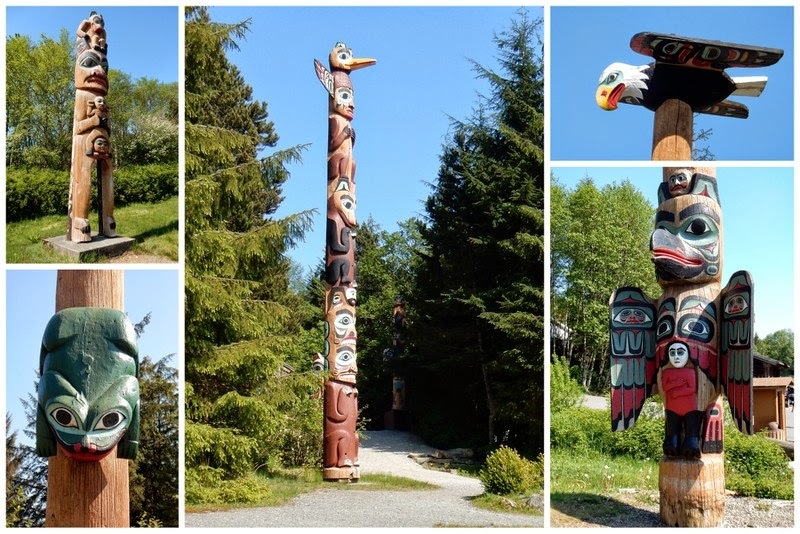 Located within the context of a thriving Alaska Native community, Saxman Totem Park contains the largest number of standing totems in one location and includes examples of the best totem pole carvings in southern Southeastern Alaska. Totem poles are strategically placed on both sides of the road that leads to the park-like setting that contains the clan house. Most tourists visit Saxman on cruise ship tours, and we arrived just as two buses were about to depart. We caught the tail end of a presentation by a young Tlingit carver and saw several totem poles that were in different stages of completion. It has been interesting to learn about the various types of totem poles, as well as their significance and the stories that they tell. We especially enjoyed identifying the various symbolic characters that are represented and often repeated on the various totems. The two totem parks provide a different experience than the one at the Totem Heritage Center, and I’m glad we decided to visit all three. We spent the early evening in downtown Ketchikan after all the cruise ships had departed, and what a change it was. Most of the shops were closed, and it seemed as if the town had rolled up the sidewalk. It was then time to head to the ferry dock and try to catch a nap before it was time to board the ferry. Easier said than done, but we survived. I still can’t believe the beautiful, sunny days we enjoyed in Ketchikan. May is one of the best times to visit Southeast Alaska if you want to lessen the chance of rain. It certainly worked for us. I’d like to offer one last tip to any RVers who may be considering a stop in Ketchikan. Before we arrived, we had read that campground water in Ketchikan contains tannins and is the color of tea. Although the water is potable, it’s not what I wanted to run through our water filter or add to our fresh water tank. So, we filled our tank before boarding the ferry in Prince Rupert and bought bottled water for drinking and coffee. (We almost never use bottled water, but our tank is small and we would not have lasted without it.) We will refill our tank when we get to Wrangell, our next stop. I loved Ketchikan! Lucky you to be able to spend time there. Torrey still talks about the totems. Ketchikan was special, and the native heritage was so interesting. It doesn't surprise me that Torrey appreciated the totems. Thank you so much for the mention! It is so hard to explain to non-full-time people that we actually have to have down time and maintenance time. They wonder what we do all day...You explained it very well! Thank you. It was actually your post that hit the nail on the head, so to speak, for me. It is hard for most people to realize that we are not on vacation. This is our life.